Are we about to find out the cause of the infamous elevator fight between Solange and Jay Z? The answer is Yes..according to New York Times best-selling author J. Randy Taraborrelli. 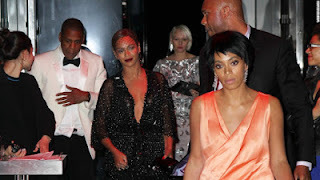 The author claims to have the sordid details of what went down between Beyoncé's sister and husband, which he intends to reveal in his new upcoming unauthorized biography, titled 'Becoming Beyoncé: The Untold Story'. The book, according to the author, is based on exhaustive research and exclusive interviews with the people in the superstar’s life who have been pivotal to her personal and professional development. Among those interviewed was Brian Moore, the former Manager of Destiny’s Child. J. Randy's Publisher, Grand Central Publishing claims that the book will also delve into the Superstar's personal life including details about her ex boyfriends and relationship with her father before and after she fired him and why she fired him.